There are so many great free options for advertising and marketing your business these days that talking about paying for advertising is unusual for me. But the truth is, if you’re not paying for something with money, you’re paying for it with time. 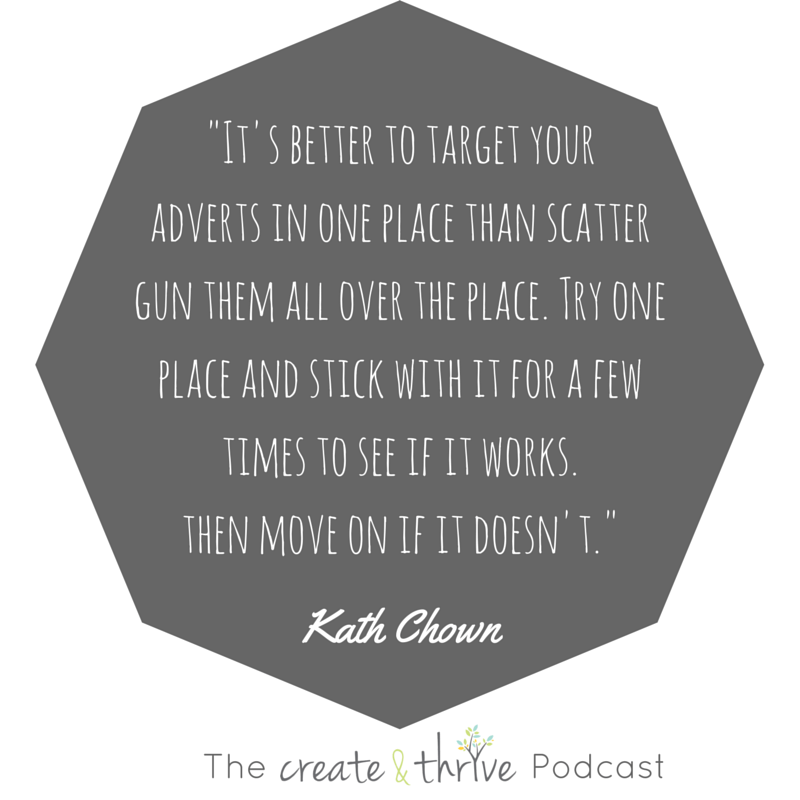 We recorded this month’s conversation about how to find affordable advertising which is targeted towards your ideal customer. Making sure you know who your perfect customer is will be the very first step you need to take in the process so if you haven’t done this yet, now is the time! A marketing plan is key and you can find a great link to Kath’s post about an annual Marketing Calendar here and here. Once you have these things in place, it’s all about research and making sure you know all about the publication or website where you’re spending your money. Listen in for all the inside information about how to advertise your business on a shoestring budget. There are so many free options for advertising these days – you should try a lot of those before turning to paid advertising. Decide on a marketing plan. Don’t just start paying for advertisements willy nilly. What are you advertising? (the brand, a product, a special deal, a seasonal product). Do an annual plan with dates you need to pay for adverts (and the reasons why). Research – If you can’t afford to buy the magazines/print publications you want to check out, go to your local library or ask friends if they have copies. Read up about the online blogs or websites which are offering paid advertising spots. How many readers do they have? What are their demographics – are these your target customers? Do they have a ‘product’ or ‘indie brand’ section which you could slot into? What are other people saying about the publication? Figure out a budget and stick to it – no matter what the advertiser wants from you. Start small and ask for a discount. I have found that almost all larger businesses I’ve worked with are happy to give you a discount to trial your advert. Smaller businesses are just like you and may not be able to give you much of a discount – but they might have a smaller and more concentrated group of people who could be your perfect target market so it’s worth paying the money. Think outside the box. There are loads of places where you could spend a bit of money for a potential sales gain. Give away some freebies to encourage people to purchase from your store. Print postcards or fliers and deliver them to mailboxes in your local area or to businesses which might have a lot of traffic. Sponsor your local fete or school event – they will usually do a lot of advertising for you in advance. Promoted Listings on Etsy have been successful in the past. Build brand awareness with this new audience before giving up.